I’ve just bought this camera on Ebay; it arrived yesterday. 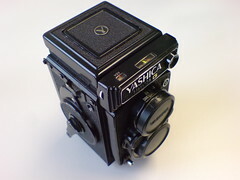 It’s a Yashica Mat-124G and shoots 6×6 medium format film. So, today I wandered around Covent Garden at lunchtime to take a few shots. What a world of difference from using a digital SLR. Having to check and set exposure for each shot and wind the film on kept throwing me (predictably). I’m shooting colour negative film which has decent exposure latitude so hopefully it won’t matter too much if I under or over expose. Manually focusing the camera also made a change, but it was so easy with such a massive bright viewfinder – I manually focus with my SLR too sometimes but with the tiny dark viewfinder I often struggle to see if my subject is sharp enough. It’s so much easier with this camera. Those are all big changes sure, but the biggest change for me was the way that I held the camera and shot with it. With my SLR I hold the camera to my eye and use the viewfinder to shoot. The Yashica though is on a strap around my neck and I look down at the viewfinder. It may not seem like a big deal but it’s a crucial distinction for me. I enjoy street photography but often feel very self-conscious when I raise my camera to my eye to shoot a street scene – I guess I’m paranoid that someone I’m shooting will take offence. But when shooting with the Yashica there’s no obvious sign that I’m taking a photo as you don’t move the camera at all. It makes all the difference for me. I know I’m probably making myself sound like some sort of sneak who is taking pictures of people without their permission and it’s true that I don’t ask permission when taking street photos. But I’m not exactly invading privacy, my photos tend to be from a respectable distance and often you can’t make out people’s faces. As I walked around Covent Garden today with the camera around my neck I got a few curious looks from people who were close enough to me to see what I was carrying, but the vast majority of people didn’t look twice at me. At one point I stood in the middle of the crowded central market and took a photo of some people browsing a market stall. I couldn’t really imagine myself doing that with my SLR – hard to define why, just natural shyness I guess. As it was, nobody turned a blind eye to me. So, I managed to shoot about half a roll of film (around 6 shots) – I need to go out again on the weekend and shoot the rest of the roll, then get it developed and scanned. Hopefully the camera works fine and I didn’t mess up too much and I’ll get some half-decent shots.